Remake of the all time favorite 6L6 classics by RCA and GE. The TAD 6L6GC-STR is your perfect choice if you are up for the sound of the rock legends. It provides the low end with the right amount of pressure, as known from the famous RCA tubes. It has clear, transparent but unobstrusive highs and exactly the right bite to provide you with all those classic 6L6 sounds from big warm cleans to modern hard rock sounds. This TAD 6L6GC-STR combines the famous reliability of the american made Philips/Sylvania STR series (also known as MESA 6L6GC-STR415) with the black-plate system of the highly regarded vintage RCA 6L6GC tubes. We joined best of both worlds! 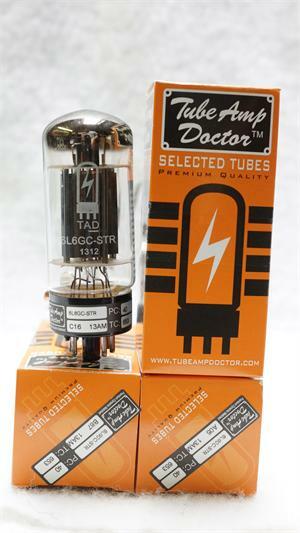 Silky top end, combined with deep bass response and lots of headroom make this tube a living classic. Our choice for lively clean sounds and powerful broadband multichannel amps.